Shipyard Architect in Dulaks harbour drops Fulginate Ore.
Best place to farm this for those wishing to work early 225-245 smithing is Chardok. While camping for the snare hammer, I farmed library, King, and Queen rooms and got a 60+ in about 3 hrs. Also a ton of Binding powders. Way better drop rate that Grieg's. also dropped off exhausted boar in crypt of nadox . What to do with patterns? So, once you've made the patters out of the Indium Ore, do we know what armour can actually be made from them? Can't seem to find anything online or in-game. 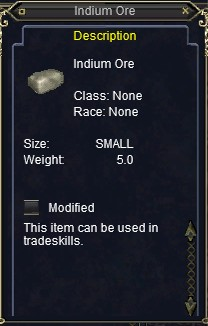 Indium is provided purely as a skillup path for smithing... the templates are not used but can be sold back to vendor to recoup some losses. You will see at the last patch they should have removed the tradeskill flag from unusable items such as this. Dropped today in Veksar off of "an iksar golem". Add the stonemite Goblins in goruka mesa. Had the ore drop of a shaman and a straight goblin last night. Suspect it can drop off all of them and had lots of the other new tradeskill bits drops including fine silk, fine hide, excellent silk, rhenium ore, fine spinnaret, and some marrow and loam but cant remember which of those. This drops in Sirens Groto as well as several other items. I do not know what it is for. Dropped off Bashmaster, Dromrek Cook, Foodpicker and/or Dromrek Provisioner in Goru'Kar Mesa. Picked up one of these today in the hole. Not sure what it's for so. Any info would be great. Looks like a new item though. This also drops off "a small mushroom" in Fungus Grove"